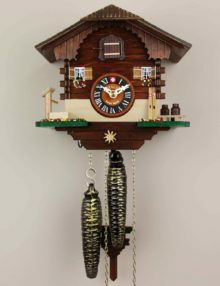 California Clock is the exclusive US distributor of Loetscher Cuckoo Clocks, the only genuine Swiss chalet cuckoo clock maker today. 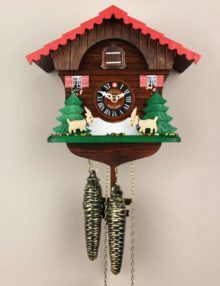 We have imported these exquisite Cuckoo Clocks in bulk to the USA to ensure that the shipping is both safe and more affordable for collectors in the U.S.A. In the west-central part of Switzerland in the canton of Bern is a valley known as the Emmental, a dreamy, hilly landscape dotted with wooden bridges, cheese dairies, castles and idyllic farms. 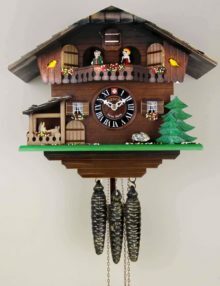 Loetscher’s “Edelweiss Chalet” clock pays tribute to this beloved region with its finely crafted rendering of a typical Emmental-style chalet. The region is also famous for its woodcarving craftsmen, two of whom you’ll find represented here on either side of the chalet’s edifice. In early summer, Swiss beekeepers living in the mountains surrounding Lake Brienz reap the benefits of alpine wildflowers from which they obtain Swiss mountain honey. Tending beehives is a vital tradition that has been practiced in the Swiss Alps for countless generations. This delightful clock portrays a scene where Barry, the St. Bernard dog, stands guard before a typical Brienz chalet. 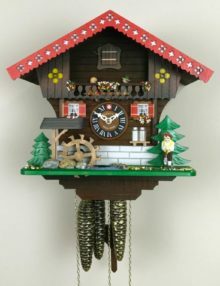 In 1920, Loetscher built their very first cuckoo clock, the design of which was inspired by the chalet housing their workshop. That very same chalet also inspired the look and feel of this model, so, as you can imagine, it holds a very dear place in their hearts at Loetscher. Loetscher once again salutes the most dearly loved fictional character in the history of Swiss literature: Heidi! Barry, the Saint Bernard dog, and a snuggly little puppy stand guard in front of the chalet. 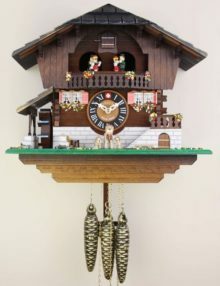 And, of course, as with all Loetscher chalet cuckoo clocks, the flowers and boulders sprinkled throughout the scene are gathered and crafted from sand found from the banks of Lake Brienz. 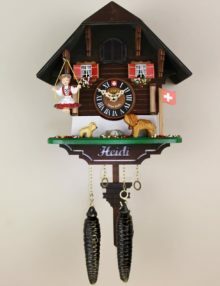 The centerpiece of this chalet cuckoo clock is a figurine of Loetscher’s beloved Heidi holding a precious kid in her arms. In the middle of the scene a goat, perhaps the kid’s mother, looks up lovingly at Heidi and the kid. Behind Heidi a pair of wooden Alpine skis, a very familiar sight in this region, lean against the front of the house. 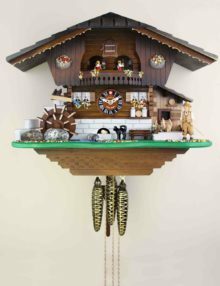 Loetscher’s “Goats at Play” chalet cuckoo clock pays homage to these wonderfully spirited animals. This model presents a scene where two goats stand on either side of the chalet, facing each other. With the sound of the cuckoo bird our goats make a playful leaping motion into the air. Below our goats’ hooves are colorful, vibrant Alpine flowers that have been crafted from stones found on the shore of Lake Brienz. 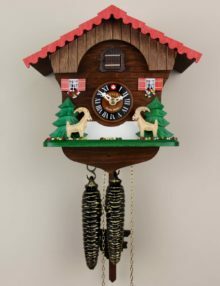 This marvelous chalet cuckoo clock pays tribute to the goat’s wild cousin, the ibex, who prefers the more vertical, rugged terrain above the snow line. Male ibex are famous for their imposing, backward-curling horns. In the scene presented here, we see two male ibex facing each other. Are they going to lock horns? Quite the contrary. Upon hearing the happy sound of our cuckoo bird, the ibex leap into the air gleefully! It is almost impossible to think about Switzerland without certain iconic images coming to mind: powdery snow, majestic peaks, rosy-cheeked skiers swooshing down endless slopes, and of course, the traditional ski chalet. 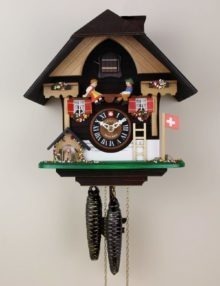 With this cuckoo clock, Loetscher pays homage to a sport long loved in this country, a passion that is handed down from generation to generation. This Emmental-style chalet has a seesaw centered just above the face of the clock. 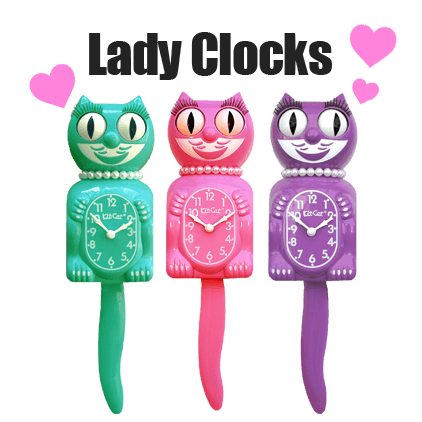 Together with the clock’s tick-tock the seesaw moves up and down and gives the clock a very cheerful character. The stones at the foot of the flag pole are collected from around the Brienz mountains and the flowers are made of sand that is carefully collected from the banks of Lake Brienz and colored by hand. 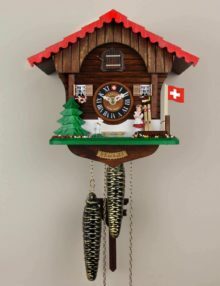 This Emmental-style chalet cuckoo clock is quite animated and playful. The centerpiece is a seesaw situated just above the face of the clock with two giddy children, a little boy and girl, on either end. The seesaw tilts up and down in rhythm with the clock’s ticking and the swing of the pendulum, infusing the whole scene with a cheerful, lighthearted mood. Loetscher’s “Woodcutter’s Chalet” model distinguishes itself from the others with its brightly painted red-colored eaves and gables decorated with yellow-colored flower carvings. When music plays at the half hour, the waterwheel rotates and the seesaw swings up and down. Never a dull moment at the “Woodcutter’s Chalet”! 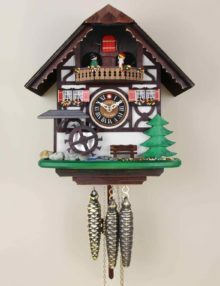 If your desire is to own a Loetscher clock that really stands out of from the rest, this Emmental-style chalet cuckoo clock offers a stylistic departure with its snow-colored facade. Decorative curved wooden beams adorn the front of the house, their dark brown color providing a lovely counterpoint to the white of the edifice, as do the red wooden window shutters. 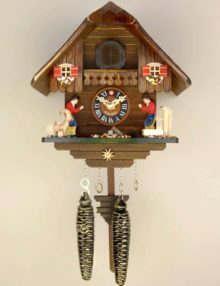 This enchanting chalet cuckoo clock gets its name from the two bright yellow birds carved into the chalet’s gable. To the left side of the scene you’ll find two curious little goats tucked away into a snug stable. When a tune plays on the half hour, the playful goats move up and down to the music, giving the delightful impression they’re dancing. At the same time, figurines on the balcony twirl upon hearing the music. This clock charms with several lovingly crafted features, including a rotating waterwheel and steps leading to a corner veranda adorned with delicately detailed flowers. And, of course, there’s our best friend Barry standing at the front of the chalet, bookended by two very kissable Saint Bernard puppies. 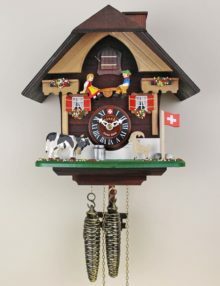 This lively cuckoo clock presents a cheerful, activity-filled day at the chalet. At the center of the scene you’ll find a strikingly handsome, exquisitely detailed black cat eyeing two little mischievous mice in the cellar. After the cuckoo calls, all these delightful features go into motion while one of two tunes plays alternately. 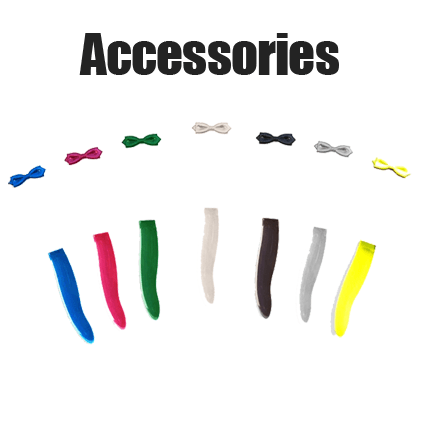 It’s a highly entertaining, show-stopping scene every time! 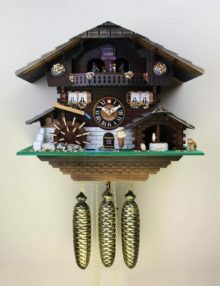 Loetscher celebrates the widely admired, hard-working Swiss miller with this one-of-a-kind chalet cuckoo clock. The scene depicted in this distinctive model is that of a miller hunched over, hauling a heavy bag of flour on his back. His apron is stained brown, bearing the accumulation of years of working with this precious grain.